In an unprecedented move to fight back against those responsible for jeopardizing its drinking water, the Des Moines Water Works filed a federal lawsuit last year against three upstream counties that have long allowed farm pollution to flow downriver into the city of Des Moines. The utility is desperate to get help in cleaning up the two heavily polluted rivers that provide drinking water for the 500,000 people in Iowa’s capital – the state’s most populous city. The suit, which will be heard next year, came about largely because the Des Moines Water Works had reached a breaking point. Despite years of asking for help from state officials and Big Ag, pollution in the river water – particularly from nitrates, which are toxic byproducts of fertilizer and manure – was only getting worse and costlier to remedy, to the tune of $80 million to build a new treatment plant. It’s essential to clean it up because drinking tap water polluted with nitrates has been linked to higher rates of thyroid, bladder and ovarian cancer. In agricultural areas, most of the toxic nitrates come from hundreds of miles of pipes buried beneath farm fields. The pipes drain excess water to allow for planting crops, and the manure and fertilizer pollution washes out with it and into nearby waterways. Shockingly, this runoff is not regulated under the federal Clean Water Act, as pollution from a factory would be. The Des Moines lawsuit seeks to close that massive loophole in an otherwise important and effective environmental law. As you might expect, Big Ag is not happy about the prospect of having to change its polluting ways, and it has launched a well-financed smear campaign against the Des Moines Water Works and its CEO, Bill Stowe. In a scathing editorial, the Des Moines Register rightly called out the Iowa Farm Bureau, cloaking itself as the ironically named Iowa Partnership for Clean Water, as the source of a series of attack ads that ran on television across central Iowa. If you’re thinking that this is an interesting story but one that doesn’t really affect you, you’re sadly mistaken. Cities and utilities across the country are facing similar issues: Toledo, Ohio, Suffolk County, N.Y., San Joaquin Valley, Calif., and parts of Michigan and Minnesota, to name a few. 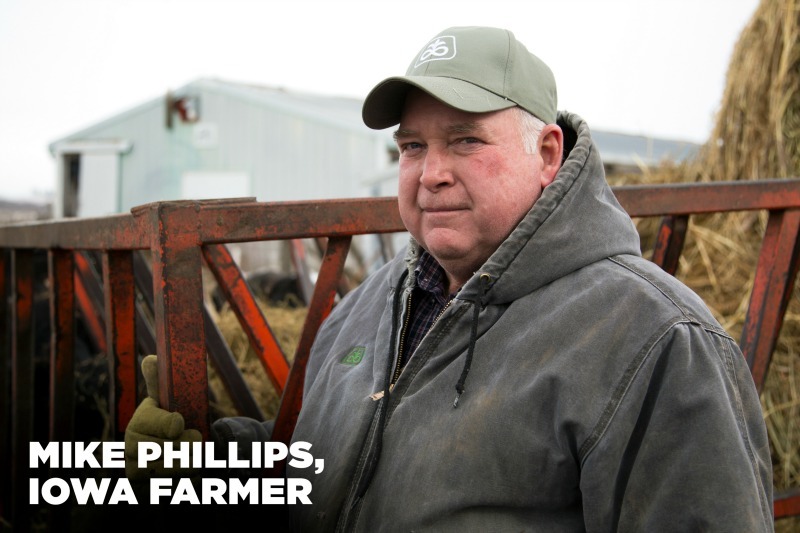 There are some farmers, like Mike Phillips in Iowa, who try to do the right thing. They implement conservation measures to curb pollution, including planting grass buffer strips along waterways to trap nitrates before they reach the stream. But as a recent report by EWG showed, voluntary programs that pay farmers to implement such measures are largely ineffective. It’s essential that agricultural interests, water utilities and local and federal government agencies work together to ensure that we all have access to clean, safe drinking water. We’re hoping that the Des Moines Water Works lawsuit will pave the way for more constructive action on this critical issue.